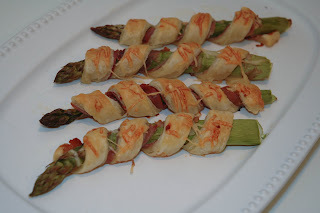 Foodspiration: Prosciutto and Puff Pastry Wrapped Asparagus that is Worthy of an Oscar! 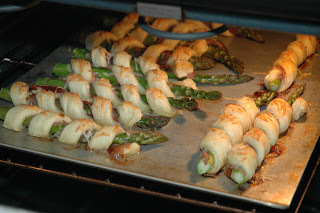 Prosciutto and Puff Pastry Wrapped Asparagus that is Worthy of an Oscar! 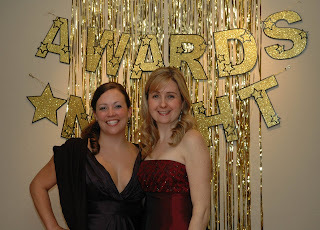 We had our annual Oscar party this year and of course, we had an array of lovely appetizers and desserts worthy of the poshest Hollywood crowd. 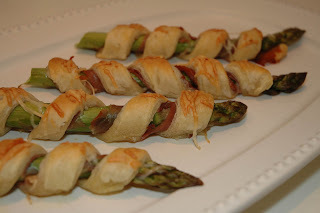 These prosciutto and puff pastry wrapped asparagus are flaky and flavorful, and easy to eat with just one hand while you balance your cocktail, your Oscar ballot or while you wave off the paparazzi! However, the very best thing about this recipe is that it is incredibly easy to make while looking extremely impressive. Before you start you must allow 40 minutes to thaw the puff pastry- I haven't found a really good way to speed this up without overheating parts of the pastry. 1. Thaw the puff pastry according to the instructions. Mine said 40 minutes at room temperature. 2. Preheat the oven at 400F. Wash and snap the ends off of the asparagus. Dry. 3. 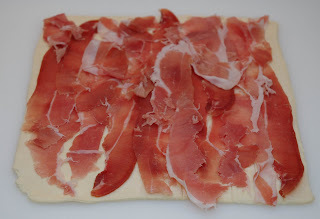 Using a rolling pin, smooth out the creases in the puff pastry and lay the thinly sliced prosciutto over the entire pastry. 4. Using a sharp knife, cut the puff pastry into about 12-14 strips- about 1/2-3/4 inches wide. 5. 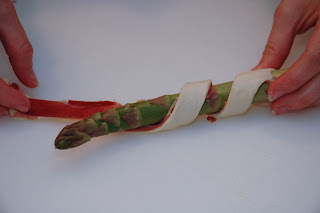 Wrap a strip of the puff pastry (with the prosciutto on the inside) around the asparagus spear in a diagonal fashion as shown. Place on cookie sheet. 6. 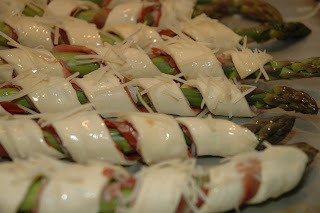 Brush each wrap spear with melted butter and sprinkle grated or shredded parmesan on top. Press the parmesan into the pastry with your fingers if necessary. 7. Bake for 15 minutes at 400F. Check the bottom of the puff pastry to make sure it is done (and not burned)- but the top should be golden brown as well. If not, put back in for 2 minute increments until finished. Mine actually took about 18 minutes. 8. Let cool briefly and serve. It was a smashing success. Cheers!